Why miss out on hiring the best applicants simply because you don't speak the same language? Help them, and help yourself, by meeting colleagues half-way when you use the Spanish words and phrases that are unique to your field of expertise. Communicate with co-workers and employers using the specialized vocabulary you need. If you want to learn to be fluent in Spanish, a full course of study is available that includes the grammar and extensive lessons you need. 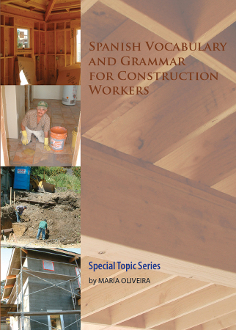 If you want to get a construction job done, the Spanish vocabulary and phrases in Spanish for Construction Workers will be your best tool!